After you find a new home buyer/renter/refinancer, the hard part begins. How to convince them you are the long-term home for their home? A novel approach, but one fraught with regulatory/risk/ROI concerns, is the lifetime mortgage, e.g., a mortgage preapproval that moves with you from home to home provided you continue to meet down payment and income requirements (NOT the UK meaning, a reverse mortgage). While reprising the Third Federal Mortgage Passport might not be possible in the current regulatory environment, there are ways to incent customers to move their other bank accounts (though, thanks to Wells Fargo, you better be super careful with sales incentives). Bottom line: No matter how well your branches are doing today, most financial institutions need to pursue viable new-account generation alternatives to make up for falling branch traffic. Looking for more inspiration for your technology stack? Don’t miss our third annual FinDEVr Silicon Valley next week (18/19 Oct). Mortgage banking can be a profitable segment, but shrinking margins, competitive pricing strategies, and lower volumes, it can just as easily be ruthless. 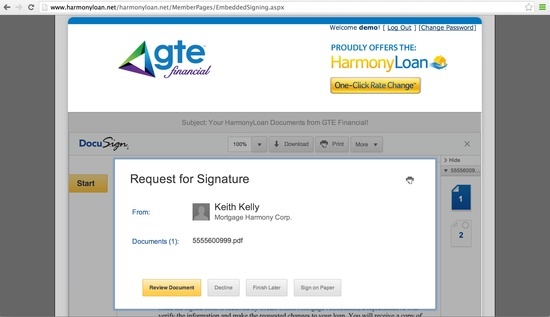 Keith Kelly Mortgage Harmony CEO, Is working on changing this. We caught up with him last week to chat about the recent partnership with Pentagon Federal Credit Union. The 1.2 million-member-strong credit union opted to white-label the platform for its users, calling it a One Click Rate Reset Protection. The system shows us the details of our current mortgage, along with what it will look like after the rate is reset. Once the signature is confirmed, the site notifies the consumer that the process was successful and informs them when the new rate will take effect. The Virginia-based company has been busy after the successful implementation of the One-Click Rate Change product with PenFed. When asked what is next for Mortgage Harmony, CEO Kelly replied that the company is working on a product for auto loans, and plans to go live with the new product with an existing partner this year. What’s more, the company is in the middle of a funding round, which it hopes to close later this year. Check out it’s AngelList site here. 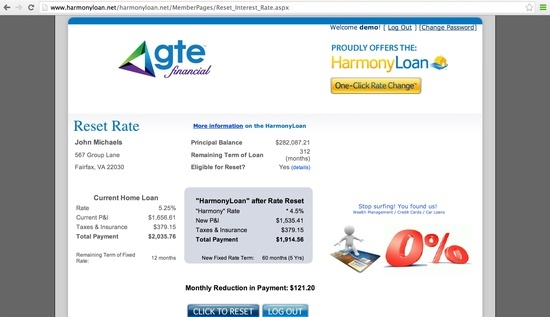 Watch Mortgage Harmony’s demo of its HarmonyLoan product that it debuted at FinovateSpring 2013. Gartner’s Web Access Management Marketscope Report gives Ping Identity a positive rating. Moven, LendUp, Kabbage, and Xero are featured in a Wall Street Journal article on alternative lenders and social media. CAN Capital raises $33 million from Meritech Capital, Accel Partners. 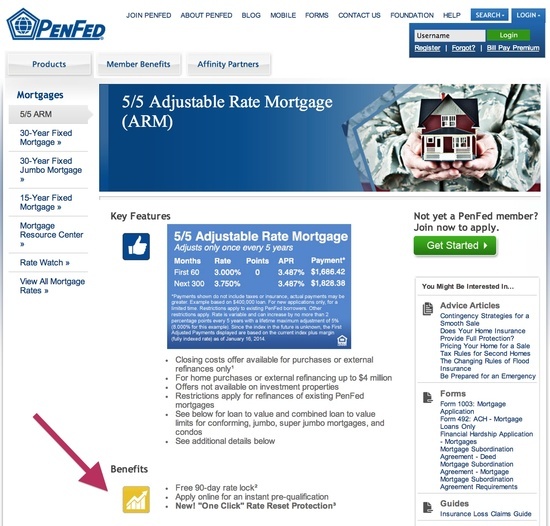 PenFed is now offering Mortgage Harmony’s One Click rate reset protection. Lighter Capital closes 39th financing with Influence Technologies. Targeting mortgage, auto, student, and commercial loans, Mortgage Harmony is coming to the stage with their HarmonyLoan technology. Executive Magazine profiles TransferWise and talks Middle East expansion. Reference Data Review takes a look at Fenergo’s efforts to make compliance easier and more efficient. ACI Worldwide announces Universal Payments Platform. TransferWise wins Estonia’s “Best E-Service” contest. Joe Brancucci, CEO of GTE Financial joins Mortgage Harmony Advisory Board. Keith Kelly, Mortgage Harmony CEO, awarded a Tech All-Star Award by Mortgage Banking Magazine. 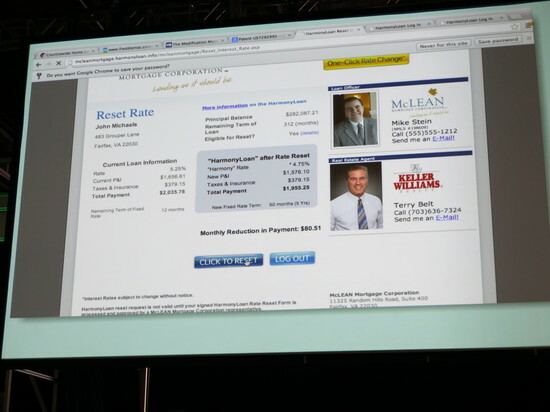 Check out Mortgage Harmony’s live demo at FinovateSpring. Ping Identity named 2013 Top Workplace by The Denver Post for second consecutive year. SecureKey named Top Growth Company in 2013 Branham300 list of Top 10 Growth Companies. Global Security Services Company selects Kofax to automate accounts payable operations in Latin America. Check out Kofax at FinovateSpring. SocietyOne introduces new fee structure. ProfitStars wins 2013 Payments System Awards from NACHA – the Electronic Payments Association. ACI Worldwide’s Architech Mobile Banking provides PFM, integrated bill payment and account-to-account transfers to iOS, Android smartphones. Azimo wins SWIFT Innotribe challenge; advances to finals at Sibos 2013 in Dubai. peerTransfer now serving more than 300 colleges and universities, has partnered with 48 new educational institutions during the first quarter of 2013. Zooz closes $2 million Series A round led by XSeed Capital. See Zooz in action at FinovateSpring in May. GeoComply and Locaid team up to bring geolocation services to mobile and Internet gaming industry. See Locaid demo at FinovateSpring in May. Innov8social interviews Julia Streuli, head of communications for Bright Funds. 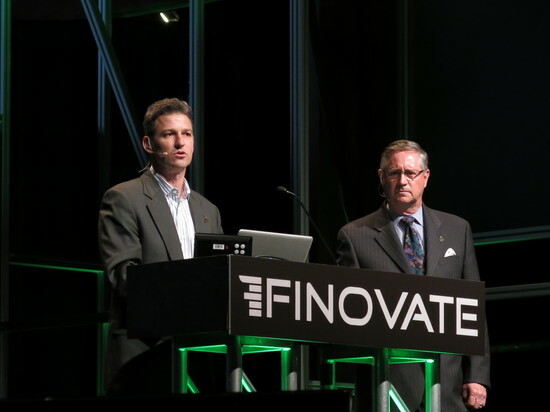 Join Bright Funds in San Francisco for FinovateSpring. More than half of the companies recently highlighted in American Banker‘s “Top 10 Tech Companies to Watch” are Finovate Alumni. Below are the six companies featured in the article, along with a link to their most recent appearance and product demo at Finovate. Read the full article from American Banker here.